Thomas Jefferson said that “one man with courage is a majority.” At the February 19 Vigil for the Victims of Hate and Violence, we saw many courageous people stand up and speak out. Two particularly stood out: Sara Couvillion & James Robinson. Both individuals are role models for the rest of us. It's relatively easy to blog (time-consuming, but not taxing). It's easy to post thoughts and links on a Facebook page, and/or sign a petition. 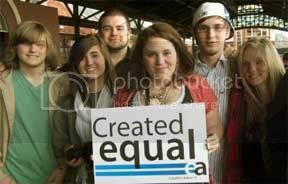 It's a lot harder to be the point-person on an issue – particularly the issue of GBLT equality in Alabama. But these two people did it anyway and every person who cares about justice owes them a debt. “Pot is illegal. Being accepting is not. That didn't go over too well and it took legal pressure from the Southern Poverty Law Center to change the school's policy. 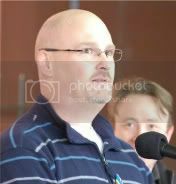 Instead of giving up, he put his life back together and founded GLBT Advocacy & Youth Services in Huntsville, AL. Many GBLT young people are kicked out of their homes and mercilessly bullied by classmates. It has resulted in a epidemic of suicide and homelessness among gay youth – and Alabama is at the bottom in supporting these kids. Robinson saw the need and founded a non-profit agency to provide services to this community: support groups, mentoring, and even temporary housing. He's told me in past interviews that if he'd had access to that as a teenager, his life would be very different now. As it was, the self-hatred Robinson felt because of the anti-gay slurs and messages from those around him almost killed him. Literally. Now he's dedicated to giving kids in similar situations a fighting chance to grow up as healthy adults. For his efforts, Equality Alabama awarded Robinson the “Billy Jack Gaither Humanitarian Award.” It's given each year in memory of a gay man who was brutally murdered in 1999. Courage isn't just facing fire on the battlefield. It's also getting up every morning determined to not only face some bad situations, but to do whatever it takes to make them better. Watch the video of these two remarkable people on the flip. I promise it will make you feel better about our state and the people in it. Here's Sara Couvillion. You can tell she's nervous… but she speaks anyway. You go, girl!